Last week, the Alexandria (Va.) City Council voted to support continued operation of the museum at Freedom House, at 1315 Duke Street. This building once housed one of the largest slave-trading businesses in America. I hope with extended opening hours and programs, it will become the focus of much-needed conversation on this aspect of our history. A supply-and-demand business where the commodity was humans. A heartache. If it's hard to fathom the idea that your partner and/or children and/or parent and/or sibling could be sold--with you having no control, no idea of there they would end up, and no way to have contact with them again--that is why Freedom House is important to preserve. Slavery was part of Alexandria's economy and society. The U.S. prohibited importation of Africans in 1808, so slave-trading found other avenues. In Alexandria, until the 1820s, slave-holders made transactions every January, either to sell or hire out the people under their control for the year. As bad as this was, the resulting transactions were usually local. In 1827, Isaac Franklin and his nephew John Armfield changed the model. Franklin already engaged in slave-trading in Mississippi and probably recognized the "business opportunity" to acquire people from this area. Many accounts point out that by then, mid-Atlantic tobacco cultivation had waned. Enslaved people were not needed to work the land but they represented an asset to cash in on. Thus, as noted above, supply and demand. The subscribers having leased for a term of years the large three story brick house on Duke Street in the town of Alexandria, D.C. [note--from 1801-1847, Alexandria was part of the District of Columbia, not Virginia]...we wish to purchase one hundred and fifty likely young negroes of both sexes between the ages of 8 and 25 years. Persons who wish to sell will do well to give us a call, as we are determined to give more than any other purchasers that are market, or that may hereafter come into market. Any letter addressed to the subscribers through the Post Office at Alexandria, will be promptly attended to. For information, enquire at the above described house, as we can at all times be found there. Cash-depleted slaveholders contacted Armfield directly or via one of the agents that he hired to travel the area. When he assembled a critical mass, about 150 people (men, women, children), he sent them by boat or by foot to Natchez or to New Orleans. There, Franklin organized auctions to sell the people to the cotton plantations of the Deep South. The company owned three ships at one point, including one that Isaac Franklin named for himself. Despite the fact that they needed to protect their "investment," there are accounts of over-packed ships that bred disease. The overland trip meant walking a distance of 1,000 miles, often chained. If you visit today, you will come upon the original building flush next to the sidewalk and street, with an alley in the back. When you enter the main floor, you will see what could have been a parlor and other reception-type rooms. According to the Slave Pen report, Armfield did not live on-site but entertained his customers in these rooms in fine 19th century style. Blacks awaited sale to parts unknown in the basement or out the back, in separate male and female quarters. The outbuildings no longer stand. However, a diagram and model of the property, built by University of District of Columbia architecture students, are on display. Visitors, including abolitionists, described what they saw and were told when they visited. We would have to assume they received a sanitized version of many goings-on; for example, one wrote that he was assured that families were not separated (which did, in fact, happen). Others wrote about watching as "coffles" of people were herded down Duke Street. This was an entirely legal operation. Armfield and Franklin retired as millionaires. (Recent articles in the Washington Post have detailed how Franklin's descendants have had to come to grips with what their ancestor did.) From the 1830s through the Civil War, the business changed hands several times. One of the agents, Joseph Bruin, also set up a competing business up the street. By 1861, as period photographs show, the building had a large sign that proclaimed Price, Birch & Co. Dealers in Slaves. When the Union Army entered the city on May 24, 1861, they headed up Duke Street to occupy railroad facilities further west. "The firm had fled, taken its saleable articles with it," according to an 1865 account, but an elderly man, chained, had been left behind. He was released and served the Michigan regiment who freed him for the rest of the war. As far as I know, he is not named in history. The army found the site could serve in a version of its original purpose--as a jail, mostly for short-term lock-ups for drunkenness or disorderly conduct, and a place to house freedpeople. When Wilbur moved to Alexandria as a relief worker--trying to improve conditions for freedpeople--she often visited what became known as the Slave Pen. In April 1863, she and Harriet Jacobs came across a black man subjected to a "shower bath" punishment. This involved the Army guards forcing the person punished to strip out in the open, then be sprayed with cold water. They learned that this was a common punishment, used on all but white women (in other words, okay to use on black women but not white). Julia must have told her sponsors, the Rochester Ladies' Anti-Slavery Society, about what they witnessed, because the group's secretary, Anna Barnes, wrote a letter to President Lincoln to complain about it. Julia wrote a more general letter of complaint to the Assistant Secretary of War. Both letters made their way back to Alexandria, where Union officials did not appreciate this attempted run around their authority. Letters found in the National Archives by Provost Marshal H.H. Wells claim the punishment was used infrequently and would cease; the letters also complain about Julia Wilbur as an "interfering and troublesome person." ...to the Slave Pen. It has not been used for a prison for 2 months past. It has been given up to the claimant Mr. Stover but Price, Kephart & Cook claim it also. Fanny Lee & her family live there yet & she has the keys. 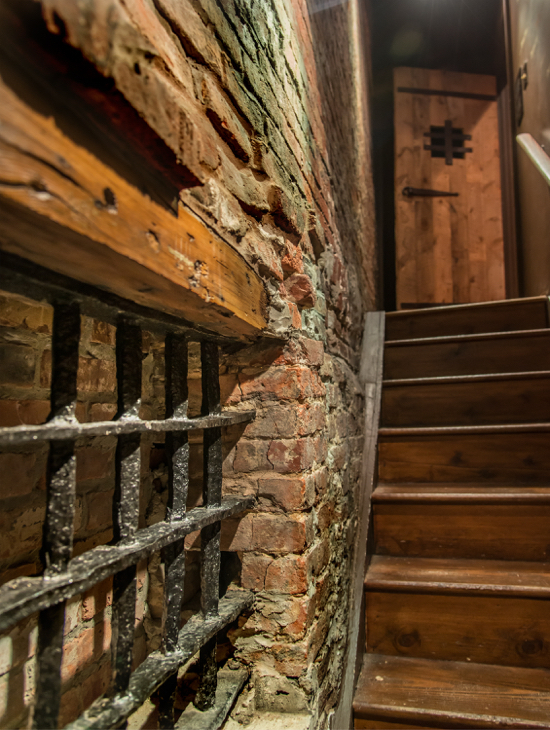 She is told to let no one in there but she says Union folks come there very often & she lets them see it.—We explored it thoroughly, cells, dungeons & all.—Fanny Lee had a brother in that jail once. The prison has double doors & I remarked when coming out that I would like to have a bolt from one of them. Said Fanny, “you can have one.” She procured an axe & went to work & after sundry heavy blows one staple began to yield. She would have shivered that door to atoms if it had been necessary to obtain that bolt for me. It! It was glorious to see her work. Here was poetic justice. A woman whose family had suffered there when it was a trader’s jail was tearing off the bolts of the prison doors because two Yankee women desired to have them. By the help of a young crippled soldier, the bolt of the inner door was taken off for Mrs. Stebbins. They worked with a will & we felt like shouting glory, hallelujah over the literal downfall of one of the famous Slave Pens of Alexa. When I first came to Alexa. in ’62 & this slave pen was the terror of all the colored, as well as some of the whites. It did not occur to me then that I should ever see the bolts removed by a woman once a slave, & that I should bring them away. At one time I was not allowed to go in there because I exposed some of the deviltry practiced there. Mrs. Lee gave me the Prison Book for 1865. Containing the cause for imprisonment & sentence, for instance 4 col'd [colored] men for tossing cents here put in for [Note: blank space left] days each & [Note: blank space left] showers. Oh! Such injustice as has been practiced there towards prisoners by Union officers! The building had a number of uses through the years and changed ownership several times, as the Slave Pen report details. Alexandria Hospital operated in the building from 1878 to 1885. It gradually deteriorated to become rented rooms and small apartments. Fortunately, enough of the history remained so that as development took place around it, the building was registered as a National Historic Landmark. It was purchased by preservationist-minded couple from Washington, J. Peter and Betty Dunston, in the late 1970s. The Northern Virginia Urban League purchased the property for its offices in 1996. The exhibit space opened in 2008. However, the museum was open limited hours and only on weekdays. It will now be open Thursdays through Saturdays, 1 to 5 pm, for a small admission fee.